Gisela Eberhardt is Managing Editor of Edition Topoi’s book series and online-journal, together with Nadine Riedl. Heading the editorial office of the “Berlin Studies of the Ancient World” and “eTopoi. Journal for Ancient Studies”, they coordinate and monitor all stages of assesment and production, from manuscript submission to the creation of books and journals. 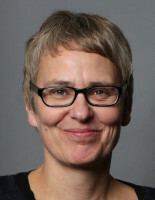 As an archaeologist and a historian of science, Gisela Eberhardt has conducted research on Prehistoric Central Europe and on the history of archaeological knowledge, in particular the emergence and development of archaeological methods in the 19th and early 20th centuries.